Take an Advent break and choose from more than 70 city apartments of all sizes. No reservation fees. Salzburg is a romantic setting for Advent - the fortress on the hill in the centre of the old town; the historic palaces and cathedral surrounded by market stalls; and the snow-covered mountains as a backdrop on most sides of the city. The main markets with their own websites are listed below. The best-known is the one outside the Cathedral and Residence, but both of the historic palaces also have a market nearby. Smaller ones are also located up at the fortress and on the Kapuzinerberg hill on the other side of the river. This market is the most popular in the city, held outside the cathedral and the Salzburg Residence in the heart of the old town. The Mirabell Palace is situated on the opposite bank of the river to the Residence and the Cathedral. Strictly speaking, Hellbrunn Palace isn't in Salzburg, but it is a very historic and romantic location for an Advent market and very easy to get to from the city, with a shuttle service offered at weekends. 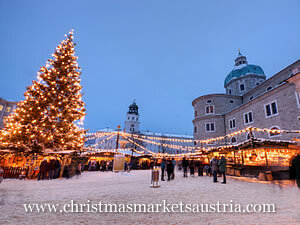 The Sternadvent Christmas market is a relatively small event in the courtyard of the Sternbräu guesthouse in the old town of Salzburg. Tickets are available through a form on the website. The Adventsingen concerts are also held at the weekend in the Large Festival Hall (the one that is used for the Salzburg Festival) at the foot of the Mönchsberg. Ticket availability can be seen on the website. The concerts are held in the Gothic Hall at the St Blasius church near the Getreidegasse. Take in the culture. Salzburg is proud of its role as a city of music. 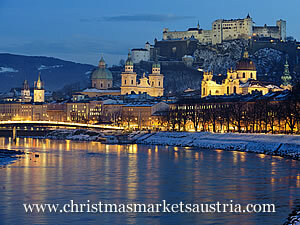 The city can boast famous connections to Mozart as well as the slightly more lowbrow 'Sound of Music' locations. There are generally some worthwhile performances being given at any point in the city. Look at the history. The palaces are mentioned above as locations for a couple of the Christmas markets. There is another on the fortified hill above the town. The pedestrian area and neighbouring city centre will be a hit for those who enjoy historic walking tours. Pack your sweet tooth. Sure, the coffee houses and tempting cakes can be found all over Austria. But Salzburg can boast two local specialities: the Mozartkugeln (those chocolate balls filled with pistachio marzipan and nougat) which were created by a local confectioner in the 19th century; and the Salzburger Nockerl (a dessert of whipped egg yolks, sugar, dough and milk) which was allegedly created by the mistress of one of the most famous Prince Bishops of Salzburg. Salzburg Airport is located in a suburb to the west of the main town centre. It is easily reach by bus and car and is not far from the main A1 motorway which links the city to the western and eastern parts of Austria, as well as to Munich in Germany. Salzburg's main railway station is situated to the north of the city centre on the eastern side of the river. The station offers good national and international connections around Europe. The local train, tram and bus services in the area are run by the Salzburger Verkehrsverbund (SVG).